One of the new Tazo tea lattes at Starbucks is the London Fog Latte. 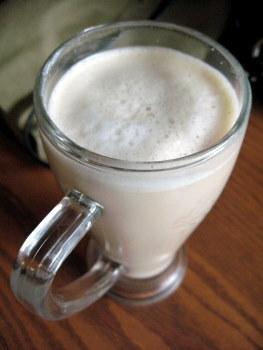 It’s made with Earl Grey tea – hence the “London Fog” name. Earl Grey tea is a classic tea, a longtime favorite of many tea drinkers. It’s made with black tea and is flavored with bergamot, a citrus fruit with a orangy perfumy flavor. Starbucks uses vanilla syrup in their London Fog recipe to highlight the bergamot and give the tea a full, warm flavor. The drink is easy to make at home if you have some vanilla syrup on hand, whether it’s homemade or store-bought. Earl Grey tends to get a little bitter if it is oversteeped, so be sure to use double the amount of tea to get double strength tea for your tea latte instead of simply letting the tea sit longer. Also, feel free to use more vanilla if you like your drink a little sweeter. Pour hot Earl Grey tea into a large mug or other serving glass. Stir in vanilla syrup. Steam milk, or heat it in the microwave and whisk until very frothy, and pour it into the sweetened tea.